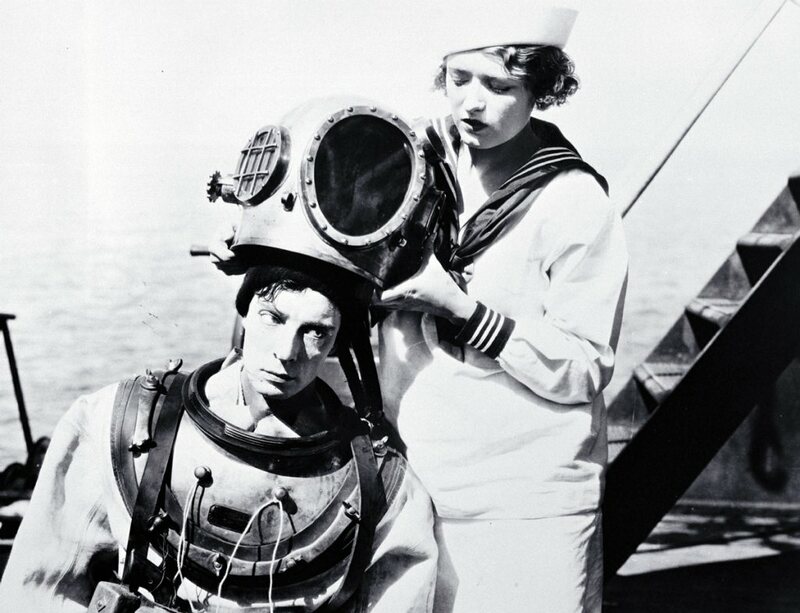 On Saturday, May 23, The Navigator, one of silent comedian Buster Keaton’s best films, is screening at the Pioneers and Soldiers Memorial Cemetery. 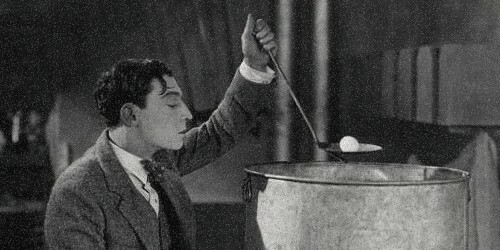 The following article addresses Keaton’s films as a whole and why they play even better today than they did 90 years ago. In college I hosted a weekly movie night. It began humbly, on a small analog TV in my dorm where I would screen personal favorites, classics, and obscurities with no specific rhyme or reason to the selections. Over the next few years, thanks in part to my persistence but thanks even more to the fact that I had nothing better to do, our numbers began to increase. I could only cram so many people onto my handful of chairs, bed, dressers, floor, and desk, so I applied to check out some public space at the school. There was just one problem. As some of you probably know, it is illegal to screen copyrighted films in a public space, even if it’s for a bunch of college students in an end lounge killing time on a Thursday night. I didn’t have the money to eat, much less pay the licensing fees for a public performance of Butch Cassidy and the Sundance Kid. Our RA was also the sort who checked on these kinds of things, and while I wanted to make room for growth, I didn’t think people would want to watch the movie on my laptop. So I brainstormed a workaround: every single film would be in the public domain. Public domain films are not subject to intellectual property laws and are therefore able to screen in classrooms where we eventually wound up. It was a great fix in theory. 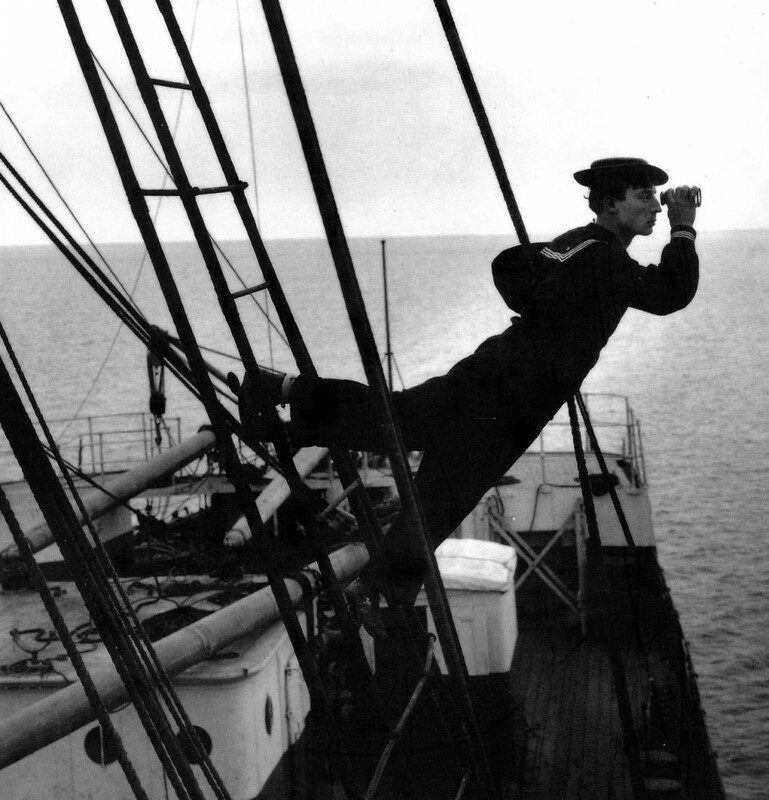 The catch was that most films enter the public domain because of their age, and hence a majority of them are also silent. Over time I found a better solution, but for a solid year I was confined to a handful of films that either lacked sound or producers competent enough to renew their copyright. Also over this time the screenings exploded from audiences of ten to fifteen people to more than thirty a night which enabled us to get funding from the school. There were many reasons for this unlikely popularity, but I think the primary one was Buster Keaton. Buster Keaton—and I say this with years of market testing to back me—is probably the greatest entertainer in the history of movies. I have yet to find an audience, seven or seventy, theater major or football player, who, once urged, nudged, blackmailed, or forced at gunpoint into the room, will not laugh themselves silly at his particular brand of comedy. The reasons for this are myriad, but what I discovered was that if I opened with Buster Keaton I could win over every single person in the audience immediately and even open them up to more difficult films like Fritz Lang’s M or Carl Dreyer’s The Passion of Joan of Arc. I got bold and started betting money on this. I never lost a cent. I’m going to make the same pitch here that I made to my skeptical classmates. I realize comedy is completely subjective. People laugh at what they laugh at. If you have to explain the joke, it didn’t work. But there are a number of reasons why Keaton’s films play so well to modern audiences and they’re worth explaining just to get people in the door. I think the perception most people have of silent films comes, not from actual silents but from modern parodies of stoic old films with exaggerated emotions and drawn-out melodrama. And sure, there’s plenty of that out there. Still, economic disparities in audiences aside, the good silents appealed to the same audiences as the books of F. Scott Fitzgerald or the music of George Gershwin which people readily enjoy today. We think the silent part is what turns us off, but I think if people actually thought the material was as rigorously inventive and exciting as the books and music from the same period, they would be more willing to try. Also when most people today think of silent comedians, they tend to think of Charlie Chaplin. I enjoy Chaplin and have seen City Lights and Modern Times play to the amusement of many, but Chaplin is very sentimental and he does exaggerate quite a bit. Someone who hadn’t seen much silent comedy might enjoy Chaplin while expecting that he was just the best version of what they find unappealing about silent movies in general. 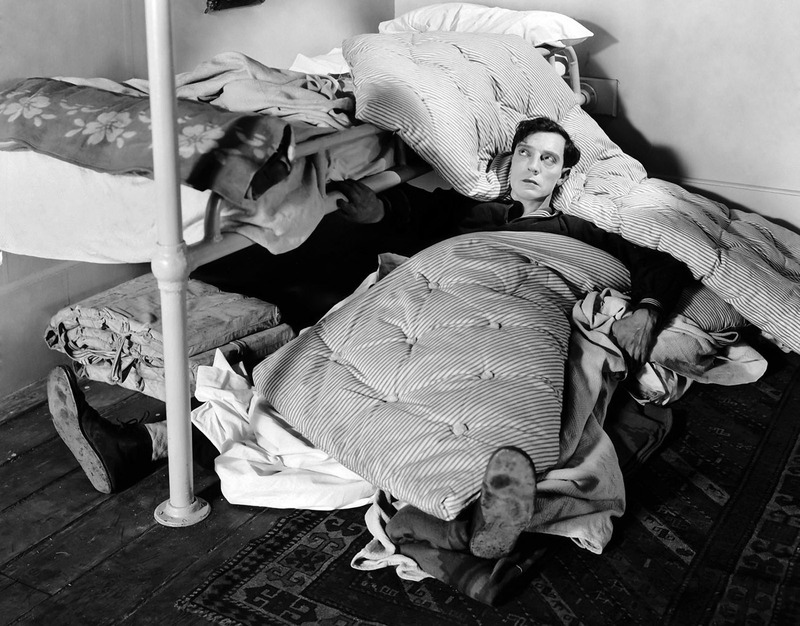 Buster Keaton is the very opposite of sentimental and the very opposite of slow. He used to say that his goal was to get the audience to try to outguess him, then prove in the end he was actually two steps beyond what even they expected. His jokes are tailor-made for meme culture because he sets up a simple premise, makes us believe he’s going to do something we’ve seen a million times, then exuberantly throws himself in a completely different direction. For instance, in The General he sets up the camera so we’re expecting a a looming train in the background to run into him. You expect to shrug at the wanton destruction of two trains colliding, but instead something utterly different and utterly logical happens. Here’s a montage of moments that have been feeding commercials and TV reveals for almost a century (here’s an excellent article about Keaton’s influence on Mad Max: Fury Road). And for this reason his films often feel like they were made yesterday. Just try explaining how his detective comedy Sherlock Jr., for instance, could have possibly been made forty years before the first James Bond film. It’s such a spot-on parody it’s absurd. Keaton didn’t have modern detective stories at his disposal, but he knew what audiences wanted—to be excited, to be affirmed, to see the two lovers get together, to see the underdog win, to feel like they’re one step ahead of the bad guys—and he just made fun of that, ensuring the joke would last forever. Also there’s Keaton’s performance. Unlike his clown contemporaries Chaplin and Harold Lloyd, Keaton was so inexpressive he was nicknamed “The Great Stoneface.” He said as a child in vaudeville he noticed that audiences laughed harder when he was thrown across the room and didn’t react at all. I would cringe to make the comparison were it not so apt, but in a way he foreshadows cat videos. Part of what’s amusing is that cats act in revealingly human ways, but their contorted bodies do all the talking while their faces never change for a second. The comparison of Keaton’s body to a cat is pretty accurate as well. The man was one of the best acrobats in the world, and sometimes the appeal in his films is the sheer wonder that his stunts didn’t kill him. 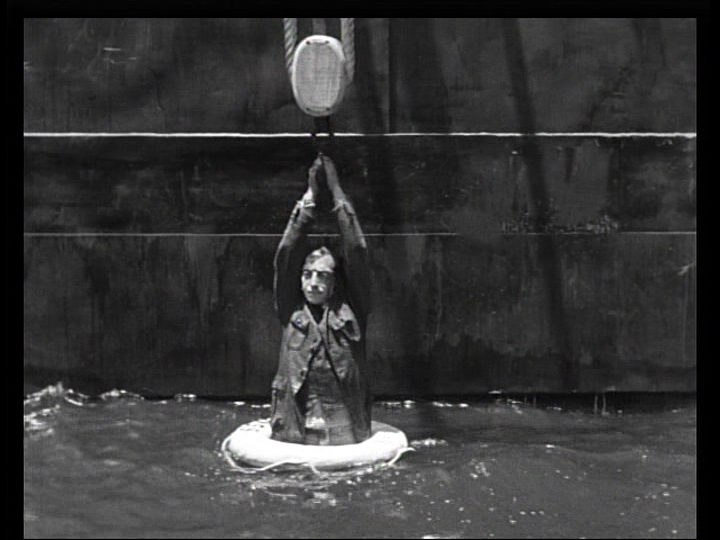 In fact, some of them almost did (watch closely on that stunt with the water tank because it actually broke his neck). Many of his best scenes are not replicable today because it would be illegal to try to repeat them. I think one of the things we lost and still very much want in modern movies where everything is possible is the joy of asking, “Wait, how did they do that! ?” (or howdy doodat?) Keaton, whose parents were friends with Harry Houdini, frames almost every shot like a magic trick so that the sheer impossibility of his leap from a train or his fall from the top of the building leaves us a little bit in awe. I withheld my “I told you so,” as best I could, though I’m not nearly as good as Keaton suppressing a grin. And I think another major appeal today is ideological. Speaking personally to a number of internet child stereotypes, I can attest that I often feel like I’ve seen everything; like my emotions have played out a million times right before my eyes, and when something goes wrong my behavior almost makes it seem like I expected it. I want things, but at the same time I don’t want to seem like I want them. I’m perpetually fascinated and perpetually bored. It takes little effort for me to relate to a man perched treacherously on the front of a train sporting nothing but a blank stare. So I implore you to give The Navigator a chance this weekend. I can guarantee it is the funniest film playing in theaters, and do so with more certainty than I would find acceptable with any other film for any other reason; and not just because the major comedies in theaters right now are Paul Blart 2, Get Hard, and Hot Pursuit. The Navigator plays on Saturday, 5/23/2015 at Pioneers and Soldiers Memorial Cemetery. The film is around an hour long and begins at dusk.